This year's Super Bowl commercials featured rambunctious geriatrics, cross-dressing husbands and Jamaicans from Minnesota. But mascots, once a staple of the advertising world, were almost completely absent from the night's proceedings. 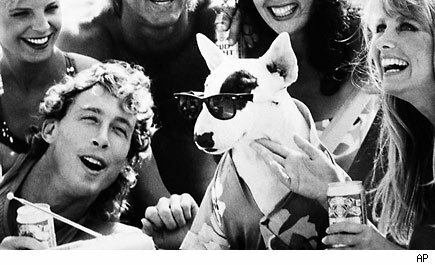 This year's Bud Light commercials largely relied on Stevie Wonder and actress Zoe Saldana, but back in the late 1980s the brand was all about Spuds Mackenzie, a sunglasses-wearing bull terrier. Meanwhile, Taco Bell made its pitch with the aforementioned hard-partying elderly, but back in the '90s it was all about a Chihuahua who professed his desire for Taco Bell in Spanish. Spuds Mackenzie was retired by Bud Light in 1989, and Taco Bell ditched its dog around the turn of the millennium. While the anthropomorphic M&Ms appeared in a Super Bowl spot this year, their healthier cousins, the California Raisins, went out of style after the 1980s. Domino's mascot/villain "The Noid" likewise saw his popularity wane in the '90s (though the pizza chain did briefly bring him back in 2011 to celebrate his 25th anniversary). Grimace, Hamburglar, Mayor McCheese and other residents of McDonaldland haven't been seen in years, and even Ronald McDonald isn't around much these days. Meanwhile, Burger King recently phased out its most recent mascot, the creepy live-action "King." There are exceptions to this trend, of course. Children's cereals like Frosted Flakes, Cap'n Crunch and Count Chocula have tied their brands directly to their mascots, so they have little choice but to stick with their tiger, sea captain and vampire, respectively. But as a general rule, animal and cartoon mascots -- particularly for beer, snack and fast food brands -- are no longer in fashion. "It's a bit of a dated form of advertising, unless someone reinvents it," agrees branding expert Adam Hanft. He notes that we started with classic, happy-go-lucky mascots like the Jolly Green Giant, before moving on to what he deems "postmodern, ironic mascots" like Spuds Mackenzie and the Taco Bell dog. Now, he says, even those edgy, ironic mascots have mostly been abandoned, with a few exceptions. Mark DiMassimo, CEO of advertising and branding firm Digo Brands, says we're seeing a sort of "back to basics" approach that places a greater emphasis on simple pleasures like babies, animals and cute old people -- and less emphasis on cartoony characters meant to evoke them. "Mascots are designed to take up the cuteness cues that babies and dogs possess," says DiMassimo. "If everybody's running with babies and dogs and you're one of the first to abstract the cuteness one level to mascots, you win. But when everyone follows you, you become part of the old style, and now you're one level down from dogs and babies." So advertisers ditched the characters and just started trotting out animals and babies when they wanted something cute. Where Domino's once used the vaguely animal-like cartoon The Noid as a recurring antagonist, Doritos now just uses an angry goat in a one-off spot. Where Pets.com once ruled the Super Bowl commercial breaks with a sock-puppet puppy, Bud Light is content to use a beer-fetching dog (and not a cartoonified canine like Spuds). And the closest thing we had to a mascot during the Super Bowl was E-Trade's talking baby. In fact, the E-Trade baby points to another reason why advertisers are ditching the cartoon mascot: Advancing technology has made it unnecessary. "Early 'adorable animation' was not realistic, and as ad people played with it, they were creating unrealistic characters they could do a lot with," says DiMassimo. "Now technology allows you to play with photorealistic stuff." There's one dead advertising trend that we don't see coming back, though: the jingle. "The jingle was a mainstay going back to radio days, but now VW and others will just pick some indie music track that will catapult someone to fame," says Hanft. "The coolness of the brand is reflected in the music." And these days, jingles are even less cool than mascots. Kids Think Cereal Mascots Are Grrreat! Could It Work for Veggies?